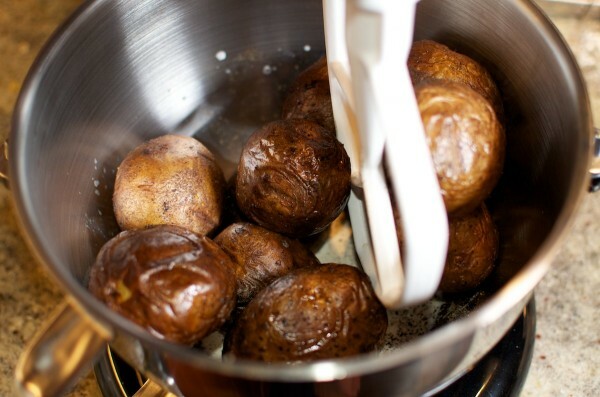 Start the cooking process by smoking the potatoes. Finish by baking them, rather than boiling. The point of the smoke, is duh, to give your smashees a definite, but not overpowering aroma and flavor of smoke. I like a fruitwood in this situation, something on the delicate side. I used cherry wood. The point of baking rather than boiling is to concentrate flavors by removing some moisture, and to get some caramelization and sweetness. Boiling just dilutes flavors, and in this case, would leach the smoke flavor away. Given that we are using dry heat, and keeping the skins on, it is important to select a potato with a thin, delicate skin. Yukon gold, yes, russet no. 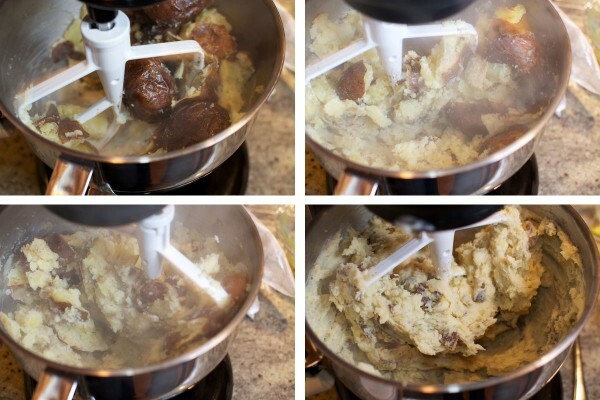 A note about mashing potatoes: Do you like eating cement? Glue? Paste? No? Then don’t over-mash, over-handle, over-mix, over-smash, or over-anything these potatoes. Have a light hand, enjoy the lumps, and enjoy a creamier, fluffier, less gluey texture. Also, you can hold the whole, hot potatoes for a long time in a warm oven, or in a bowl under a cloth, then smash them right before serving them. They don’t hold well once they are mashed. Rawr! I smash you! But not too much. I don’t want you to be gluey. From my brain, and am I ever proud. Toss potatoes with olive oil, and a generous sprinkling of coarse salt, like kosher, or sea salt. Smoke at low to medium heat, away from the fire, ideally using cherry, apple, or another mild wood. This step is pretty forgiving, which is good, because you will probably be smoking something else at the same time. Smoke for anywhere from 15-25 minutes, depending on how much smoke flavor you want, and how heavy your smoke is. Take them off the fire, and toss them again in the dregs of the olive oil-bowl. You can let them sit for a long while at this stage, if your meal timing demands it. Next, they go on a rack, and into a 400º oven. Bake until very tender when poked with a fork. Add the potatoes, all remaining ingredients, and salt and fresh ground pepper to taste to a mixer, a bowl and a potato masher work fine too. Mix on low speed, until just smashed to the chunkiest texture that you find acceptable. Less mixing is better than more. Serve immediately. This was written by cedar. Posted on Tuesday, December 27, 2011, at 10:55 pm. Filed under Recipes. Tagged A++, grill, outside, sides, vegetables, weird. Bookmark the permalink. Follow comments here with the RSS feed. Post a comment or leave a trackback. I have been wanting to smoke potatoes ever since we got our smoker almost three years ago! I love this recipe it is so motivating. I might have to bust out the smoker this weekend and make some New Years smoked veggies! Thanks for sharing. Happy New Year!! Finally, a new recipe! Now I just need to borrow a smoker. Enjoyable reading; thanks for sharing! RIP old grill, you are missed. smoked potatoes and you would have loved each other. just made these for the first time. wow wow wow. so good, thanks! Alex, so pleased you liked them! Maybe some roasted garlic mixed in? 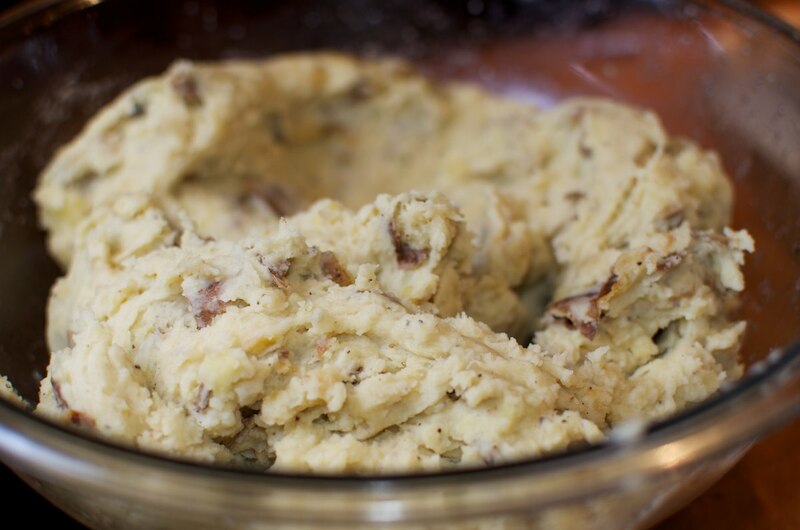 Yes smoked mashed potatoes with smoked roasted garlic double Yum!